The future of sustainable transport is already here with the Hyperloop!! 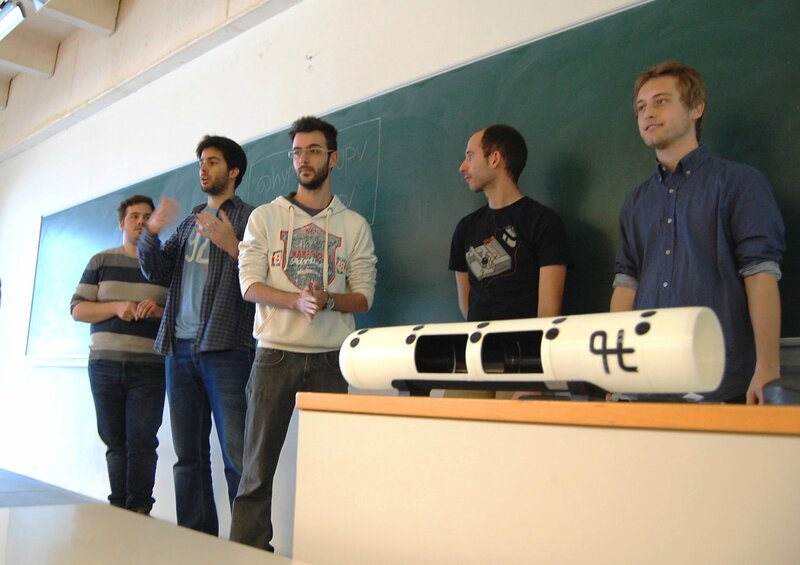 A team of five students from the Polytechnic University of Valencia (UPV), a Climate -KIC partner , were the winners in two categories of the Hyperloop award competition. Their design would be able to build an ultra-fast transport system maximizing energy efficiency and the use of renewable energy. The aerospace company SpaceX, through its owner Elon Musk ( also founder of Tesla, an electric car company and of Pay Pal, financial services and electronic payment, and of SolarCity, a company of solar power/energy products, set up a couple of years ago an international competition for the design of its ultra-fast train. This revolutionary train, Hyperloop, is a land transport system whose wagons or capsules, called pods, are driven by compressed air. Musk, a 44 year-old visionary, has developed his business and philanthropic activities in three areas he considered “major problems”.- the internet, renewable energy and space. In fact, his underlying motivation for the creation of SolarCity and Tesla Motors was to fight global warming. Motivated by his philanthropy to stimulate innovation in those areas that concerned him, he launched the SpaceX Hyperloop Competition, which encouraged academia, especially university students and independent engineering teams, to create ideas and develop them to accelerate the implementation of a functional prototype of Hyperloop. The Hyperloop was a project he began in 2012 and was designed to search for young talent that might make the best design for future development. 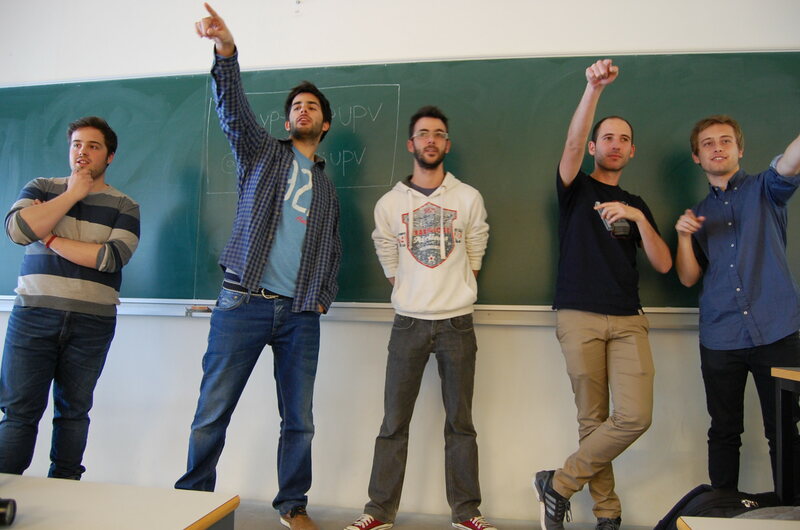 And this is where this young team of geniuses appeared, UPV Makers. 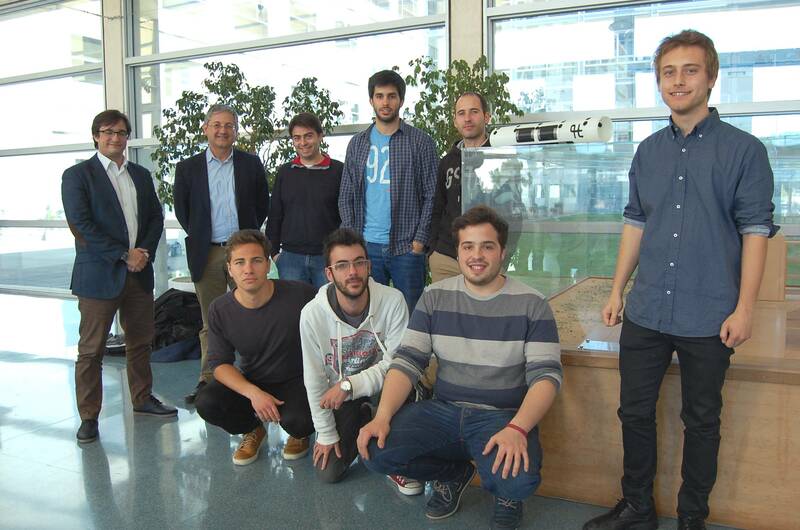 Five Valencian students of the UPV, motivated by their own youth, their inquisitiveness, their creativity, talent and …their boldness, enlisted in this aerospace design adventure and won two of the categories Musks´s competition on 30th January: Top Design Concept and the subcategory Propulsion/Compression Subsystem Technical Excellence Awards. Among them, in the building category, MIT won the first prize with their simple but effective and robust design. “A big University had to win in that category. They have lots of resources and very bright minds working almost full time”. The team was able to develop a design that levitates through attraction of the pod to the top of the tube instead of the typical air bearing configuration, which was seen in almost all teams. This way, their rail-free solution could save up to 30% in construction costs of the Hyperloop ($188M). “We designed a new configuration of levitation units that maximize energy efficiency as well as allowing a high degree of scalability” said one of the members of the team. The Valencians won a demanding jury over, which assessed mainly innovation, design, originality , feasibility of the prototype, its budget , the level of detail , its strength in testing and quality of the supporting documentation. During the last weekend in January, the participating teams flocked to the University College Station A & M of Texas, to display their projects in order to create the Hyperloop pod and win the prize.These teams came from 20 countries, mostlyof US origin and some with up to 90 participants per team from different nationalities. Only 5 people were the Valencian team, an issue that also surprised the jury. When the Director of Climate-KIC Spain, Jose-Luis Muñoz, found out this achievement, he contacted their teacher, Vicente Dolz, in order to learn more about the project and meet the team. He was invited to attend their project presentation to the first-year students in order to motivate them and demonstrate that it is possible to make dreams happen with innovative talent. At this meeting, Jose-Luis Muñoz, Director of Climate-KIC Spain with other Climate-KIC team members, explained to these UPV students the opportunities and synergies that can be developed with Climate-KIC to fight climate change with their proposals, since the Polytechnic University of Valencia is a Climate-KIC affiliate. Throughout the course of this meeting questions were raised about innovative projects and the possibility of transforming these ideas into real products and services that would benefit society by preventing global warming . They are young people who met in the setting of the Polytechnic University of Valencia, and in the alumni association of the University, the Makers UPV. This organization within the University encourages students to participate in such projects and competitions. They have similar profiles and ages, between 22 and 23, two of them came from Industrial Engineering and 3 are studying the Degree of Aerospace Engineering. But the ”keys for the success of the team have been the close working knowledge we had of each other and how far each of us could progress …” said one of them. We were impressed by the simplicity, naturalness and friendlness of these young geniuses when they explained their adventure to the young students. Also they talked about the difficulties found during the process … .such as the project being submitted 20 minutes before the deadline, 19-hour trip to get to Texas or the exams they had before and during the contest. The presentation began with an introduction and the background to Hyperloop by their teacher and mentor Vicente Dolz, who then gave the floor to the five students. They explained Hyperloop in a very simple and illustrative manner: it is a train or tube to transport goods and people. This small tube would move at high speed, levitating inside a larger pipe, which would be the channel infrastructure. “It is something similar to the system used by cashiers in supermarkets, which placed the money in a tube that is transported through a larger tube by suction effect. In the case of this train there is no suction but the vehicle has its own propulsion system, “said one of the team members. The propulsion system was similar to that of an airplane engine, with a compression-expansion cycle, without the need of storing air tanks inside the pod. A reliable braking system and safety measures were also designed to obtain a “fault-tolerant system”. “It is a revolutionary form of transport but has several technological limitations” says Dolz. The high speed is not a problem, as this is common on planes. The only thing that is being researched is how acceleration and deceleration can be made comfortable for travelers, as well as emergency braking and navigation control. What is more, it works with renewable energy. The Hyperloop already has a business and energy management model in place and is expected to be profitable in eight years. It’s attraction. It’s the future”, that’s how their slogan sounds. And these young people are on their way. They are ready to be part of the new economy, the low carbon economy, where sustainable transport plays a key role in minimizing CO2 emissions or avoiding them altogether. Without being aware of it, these young talents might be soon essential players in slowing down global warming and fighting against climate change. EIT Climate-KIC Greenhouse offers 2500€ funding and coaching for your green idea!